The Literacy Project is a place of hope. 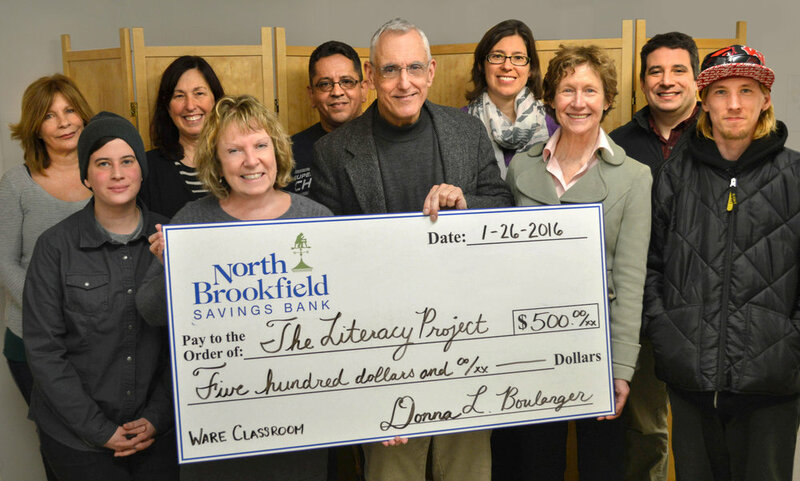 The Literacy Project is an independent nonprofit. We depend on generous donations from the community in order to keep our doors open. We are grateful for your support! Network for Good or Razoo. You can donate to The Literacy Project and many other local nonprofits on Valley Gives Day, a day of online giving to support organizations throughout the Pioneer Valley. Visit our Valley Gives page to make a donation. Judith Roberts and Literacy Project students Manny and Maria join Michael Kusick to create a radio spot for Valley Gives Day. You can show your support for the work of The Literacy Project by hosting an event at your home. Invite your friends and community to learn about the good work of The Literacy Project. You provide the venue and guest list, and we'll create a memorable event celebrating literacy and literature in the Pioneer Valley. Contact Executive Director Judith Roberts, jroberts@literacyproject.org, to talk about hosting a party. We join literary enthusiasts around the world in celebrating "Bloomsday" each year on June 16th - the day featured in James Joyce's epic, Ulysses. Join us in Greenfield, MA for a quirky, artsy celebration of James Joyce, great literature, and literacy for all. The Literacy Project is always in need of school supplies to stock our classrooms. If you're interested in organizing your own collection of donated school supplies, contact Margaret Anderson, margaret@literacyproject.org.